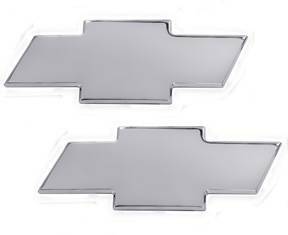 Chevy Tahoe Combo 2007-2014, Chevy Bowtie Style Chrome Grille and Liftgate Billet Emblems (96108C) by AMI®. Package contains 2 items. Without Border. Replace the cheap plastic emblem on your grille with a billet aluminum item that won"t peel or crack. Whether it"s polished, powdercoated or chromed, it"ll grace your grille.